RIO DE JANEIRO - Fabio Fognini pulled off a huge upset, stunning top seed and holder Rafael Nadal 1-6 6-2 7-5 in the Rio Open semi-final on Saturday. The Italian's spectacular victory ended world number three Nadal's 52-match winning streak in semi-finals on clay and earned him a place in the final against another Spaniard David Ferrer. "I'm really happy about this match. I beat the best player on this surface," said the world number 28, who has been in good form this year since winning the Australian Open doubles title with Simone Bolelli last month. 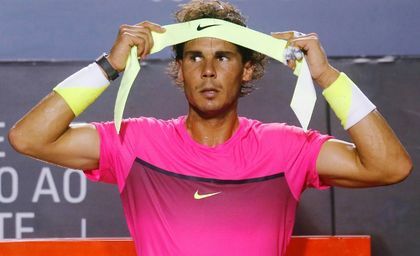 "Rafa is always difficult. From the second set I played really well, and I tried to change a little bit to be more positive on court," he was quoted as saying on the ATP Tour website (www.atptour.com). Nadal had complained of poor scheduling after Friday's quarter-final win over Uruguayan Pablo Cuevas finished at 3.30 a.m. on Saturday. Fognini played a long last eight match that lasted more than three hours on Friday before he overcame Argentine Federico Delbonis. "I'm super happy, and obviously tomorrow I will have to battle David, who has always beaten me ... I will obviously be happy if I win. If I lose, I will also leave with the good memories from this week in Rio," Fognini said after his win that took two hours and 17 minutes. Second seed Ferrer reached the final with a 7-5 6-1 win over Austrian Andreas Haider-Maurer.